Power supply unit (PSU) is one of the most important component of the computer, but perhaps the least thoroughly studied when building a PC. The poor quality of the power supply can also become a headache in the future. When the power supply cannot cope, it’s not always obvious what the problem is. Often happens when in the pursuit of cost savings buyers leave their old, low-power PSUs, and that’s why the assembled computer can either not start up or shut down under high load—for example, in a dynamic scene in a video game. Troubleshooting seems funny only when you quickly find the root of the problem, so buying the best power supply will free you from potential problems—it’s a solid investment in your computer. In the end, even a $3000 gaming computer becomes absolutely useless without proper PSU. PSU vendors: What Manufacturer to Choose? Nowadays the market of stationary PCs and components has been gradually decreasing, but manufacturers are not getting any less. Fortunately, the PSU segment is quite conservative and there are a number of companies you can unconditionally trust—Antec, be quiet!, ENERMAX and SeaSonic. 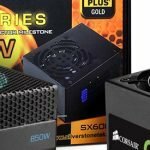 Also, your attention deserves the major players in the component market (such as Corsair, FSP, Cooler Master, ZALMAN, STM, DeepCool, AeroCool, Chieftec), which produce slightly cheaper power supply units. We would also like to mention the company Termaltake, which produces not only usual, but also an ultra-low noise PSUs, but the prices are much higher. It’s important to mention that the general advice is not to buy enclosures with power supplies for price that is less than $40. The main characteristic of the power supply unit is its power capacity. For most computers 400 watts is enough, for gaming and stuffed PCs with additional devices you will need more powerful unit—450-700 watts. To avoid paying extra money, you might want to consult an expert. That will help you to add up the power consumption of all the computer parts and make the right choice. If you don’t want, you can use simple online Power Supply Calculator from MSI. It will help you to understand the maximum peak wattage of each of the PC’s component. The reality is that the total power should be taken into account, but it is not worth giving it decisive importance. Often a mediocre power supply of 700 watts will not be better than a good one at 500 watts. And, finally, the numbers indicated on the label and in the specification of the power supply unit (400, 500 or 600 W) do not directly indicate the capabilities of the PSU. Much more important thing is not the maximum total power in continuous mode (and the number on the package is exactly what it is! ), but the potential of the 12 V line(s). All the most voracious components of the computer (processor, video card and 3.5″ hard drives) are powered from it. On the 3.3 V line the loads are quite small; the 5 V line although can be loaded with some units (hard disks and 2.5″ SSD, external USB drives and devices), but there is always a lot of power reserve. In the power supply lines +12 V can be as several, so as the only one too. The presence of several lines is due to the fact that the ATX standard up to version 2.3 is limited the current strength by one line to a value of 20 A. To circumvent the limitation, the hardware manufacturers split the lines, however in most modern PSUs the separation is virtual (the voltage of all lines is provided by a common rectifier). To avoid unnecessary trouble with the search for real total power on all lines, it is desirable to choose a power supply standard ATX 2.3 and newer (since this restriction was removed). For example Corsair CS650M, 650W, Semi Modular Power Supply, 80+ Gold Certified or AeroCool P7-850W Platinum 80Plus. 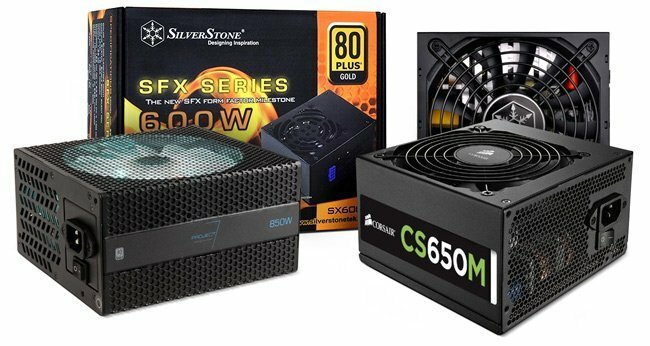 Which PSU suits best for your PC depends not only on its power, but also on efficiency. One of the key criteria is efficiency. The higher it is—the closer the amount of power received from the outlet will be, to the power given to the components of the computer. For cheap Chinese models, the efficiency is usually 60-70% giving a power of 70 W. Such unit will take all 100 watts from the outlet. In order to allocate power supplies with high efficiency, the 80+ certification system was invented, and later a new “metal” division of the PSUs into categories according to efficiency was introduced. 80 Plus Titanium. Puts forward the most stringent requirements. Added the condition of issuing an efficiency of at least 90% at a load of 10% of the maximum capacity, at 20% it should exceed 94%, at 50%-96%, and under full load—91% (Thermaltake Toughpower iRGB Plus 1250W 80+ Titanium Smart Zero or SilverStone Technology SX800-LTI 800W). It is important to note that the “metal” certificates are not awarded to power units that operate only on European networks in the range of 200-250 V, but not support the US network. Therefore, the absence of a label can only mean that the product is not designed for US, but that doesn’t mean that this product is low quality. The efficiency is not affected directly on the functionality of the power supply. However, the higher efficiency is—the less it will consume the PC and will be heated. Many cheap units can also deliver efficiency above 80% under load in the range of 50-70% of the maximum power, but they all can vary depending on the specific instance. However, even in models that are more expensive, high efficiency is not yet a sign of a reliable element base. No one often guarantees that the unit will retain its original properties in a few years. Therefore, in addition to efficiency, it is important to take into account the quality of the components.